SHOULDERPOD is a new brand born from TAMBAKUNDA, a Barcelona based product design studio. This team of engineers, architects and designers love taking pictures and filming with their smartphones, but they couldn’t figure out how to hold them correctly. So they designed two products, MOBBO and HANDDO, a holder and a handle that will convert your smartphones into almost professional photo and filming gear. 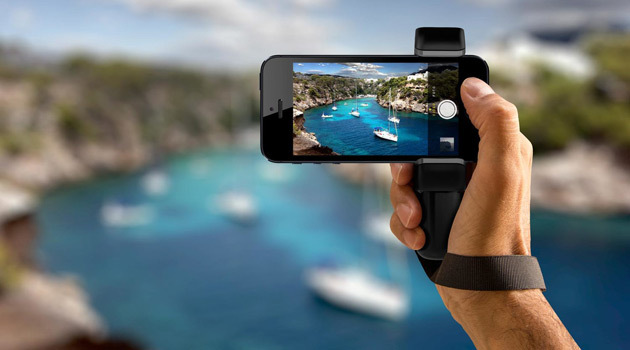 MOBBO is a tripod holder, a camera grip and a stand for your smartphone. It extends from 48 mm to 90 mm (about 1.8″ to 3.5″) for fitting almost every model, with or without a case. Thanks to its pressure screw and its rubber pads, it will hold your smartphone securely even under extreme conditions. In addition, it has a 1/4-20 tripod thread, so you can mount the MOBBO on any tripod. If you fix the MOBBO to the right side of your smartphone, it will work as a camera grip. It stands on it own, in both landscape or portrait mode, so you can take “selfies”, panoramas or time lapse movies when travelling. You can also use it as a desk stand for browsing or editing your pictures and clips. HANDDO is an ergonomic handle (machined from aircraft grade aluminum) that can be attached to your MOBBO or to any other camera for taking steady video clips, low shots or high angle views. Its also great for your “stretch arm” self-portraits or to film yourselves. 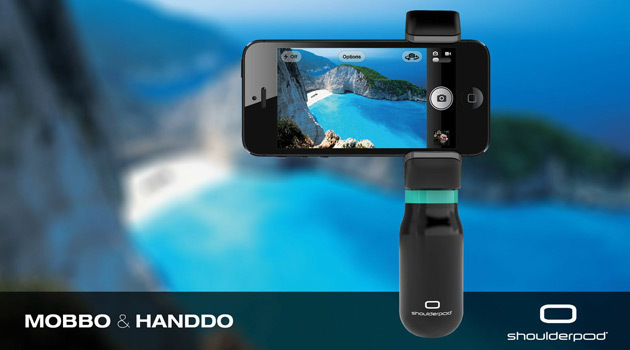 HANDDO allows you to hold your phone firmly and securely for filming or taking pictures under all situations. HANDDO can also be attached to any other camera equipped with a standard 1/4 tripod thread, like a compact or a DSLR for converting your devices into super steady videocams. Its small but comfortable size and its solid aluminum construction makes it a great accessory for the smartphone, compact or DSLR filmmaker and photographer. TAMBAKUNDA is launching the SHOULDERPOD project through an Indiegogo crowdfunding campaign. If enough people “pre-order” the MOBBO and the HANDDO through their Indiegogo campaign before August 4th, they’ll be able to make it possible. Their goal is to reach 45.000€ for funding the plastic injection molds and the tooling. But if they don’t reach their goal, then backers will get their money back. No risk on your end. If you think this product is as great as we do, then head over to Indiegogo and contribute to the campaign.